Violent demonstrations have rocked Iran since Thursday last week, leaving more than 20 people dead, with protests that started over the economy turning against the Islamic regime as a whole. The wave of demonstrations that kicked off in the second city Mashhad on December 28 and quickly spread is the biggest in the tightly controlled country since unrest over a disputed election in 2009. A few hundred demonstrators gather in Mashhad and several other towns on December 28 to protest high living costs after a call reportedly goes out on the Telegram social messaging service. Videos on reformist media show protesters focusing their ire on President Hassan Rouhani but there are also slogans lambasting the entire regime and Iran's involvement in conflicts around the Middle East. The next day larger-scale protests flare up in more cities including the western Kermanshah and key religious centre Qom, where footage shows hundreds of demonstrators chanting "Death to the dictator" and "Free political prisoners". First Vice President Eshaq Jahangiri suggests hardline opponents of Rouhani's government may be behind the demonstrations. The US State Department condemns the arrests and President Donald Trump insists that Iranian authorities "respect their people's rights". On December 30 regime supporters rally around the country for officially sanctioned demonstrations to commemorate the defeat of the 2009 protest movement. Interior Minister Abdolrahman Rahmani Fazli calls on the public to avoid "illegal gatherings" as "they will create problems for themselves". But the protests grow. In Tehran scuffles break out at the city's main university and videos show demonstrators attacking a town hall, overturning a police car and burning the Iranian flag. Unverified footage on social media claims to show thousands marching through the western cities of Khorramabad, Zanjan and Ahvaz. A regional official confirms that two people were killed in clashes in the western town of Dorud during an "illegal protest". 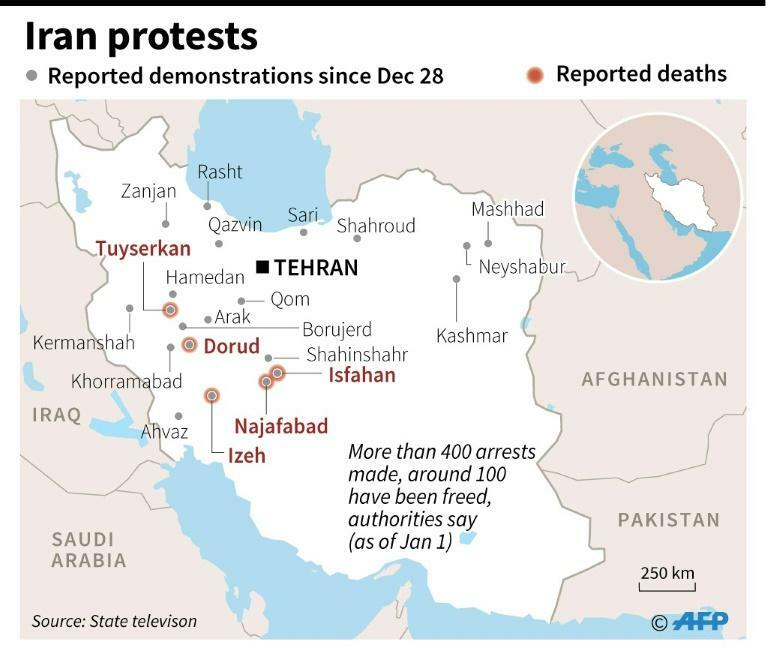 On December 31, the authorities issue more warnings and officials say 200 people were arrested during the demonstrations in Tehran and another 80 in Arak, some 300 kilometres (190 miles) away. In a bid to stall further demonstrations, the authorities block access to online messaging services, including Telegram. Rouhani insists people are "absolutely free" to express their anger but "criticism is different to violence and destroying public property." But the unrest continues as videos on social media show demonstrations hitting areas across the country for a fourth night. Iranian media and officials report that 10 people died in protests overnight Sunday into Monday, six following shooting in the western town of Tuyserkan, two shot dead in southwestern Izeh and two more run over by a stolen fire engine in Dorud. In a second statement on January 1, Rouhani plays down the protests as "nothing" and insists that the Iranian people will "respond to rioters and lawbreakers". Trump says it is "time for change" in Iran. As fresh protests break out in Tehran at nightfall Monday, state television announces a policeman had been killed and three others wounded by fire from hunting rifles in the central city of Najafabad. State television says on January 2 that nine people, including the policeman, were killed in unrest overnight Monday into Tuesday. Six died in the town of Qahderijan, in the central province of Isfahan, where protesters had tried to storm a police station, the state broadcaster reports. A young member of the Revolutionary Guards and a passer-by were also reported dead in towns near the cultural hub of Isfahan city. An official tells local media meanwhile that some 450 people had been arrested in Tehran over the past three days during unrest linked to protests. Supreme leader Ayatollah Ali Khamenei breaks his silence on the events, saying Iran's "enemies have united and are using all their means" against the regime. Turkey says meanwhile it is "concerned" and warns against any escalation.